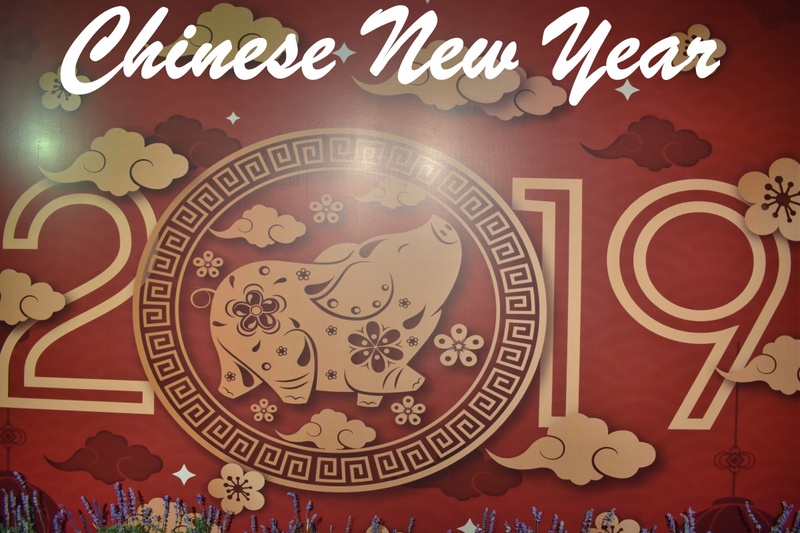 Chinese New Year is a Chinese festival celebrating the beginning of a new year based on the traditional Chinese lunar calendar. 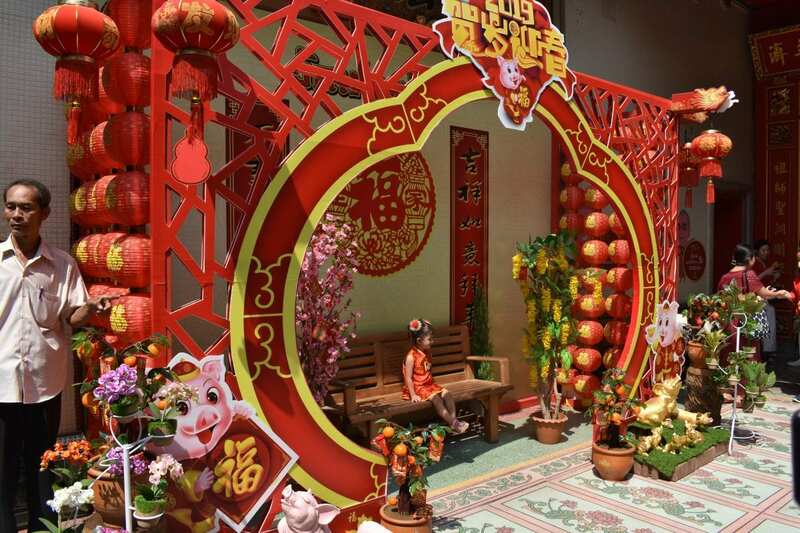 It is also known as the Spring Festival and celebrated by Chinese communities around the world. The first day of the new year is when the new full moon appears between the 21st of January and 20th February. This year it fell on February 5th. According to the Chinese zodiac, each year represented by one of 12 animals. They are Rat, Ox, Tiger, Rabbit, Dragon, Snake, Horse, Goat, Monkey, Rooster, Dog and Pig. 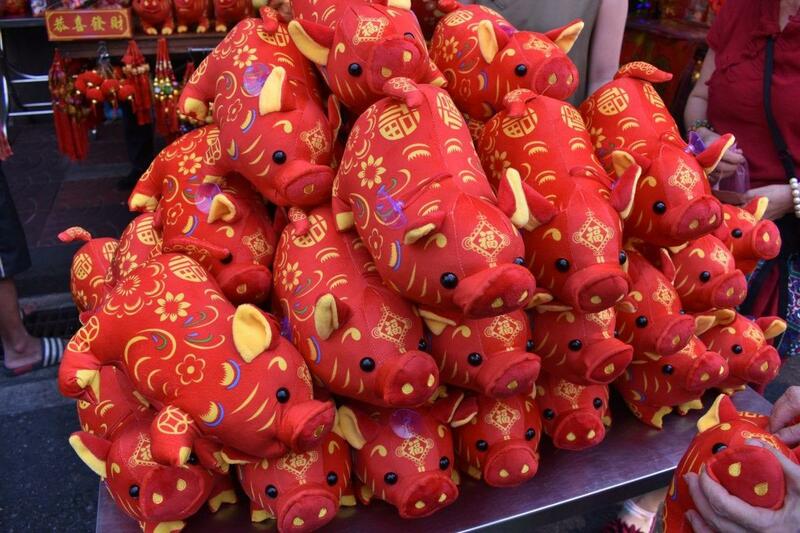 This year is the year of the Pig. 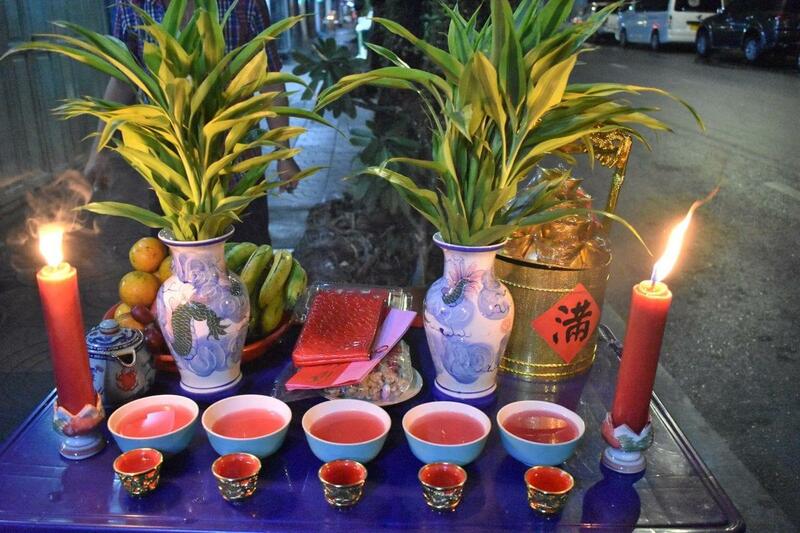 In Thailand, Chinese New Year is celebrated over three days. 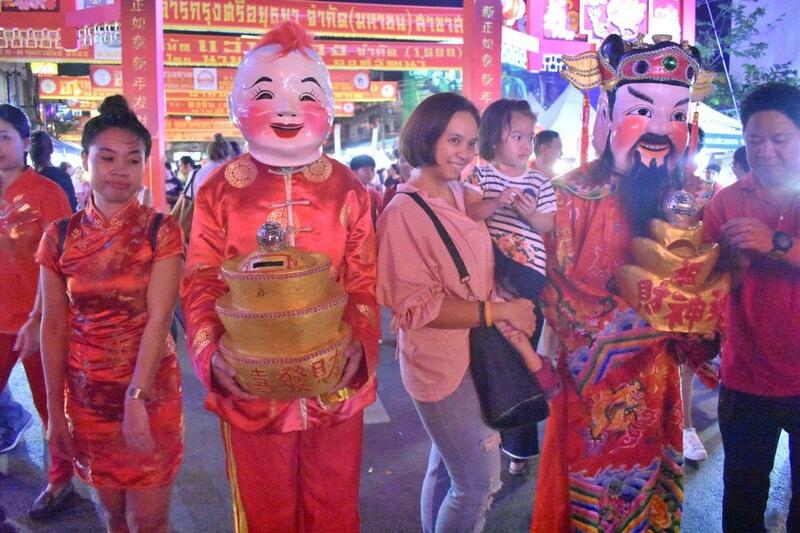 The biggest celebrations are held in Bangkok which is home to a large Thai Chinese community. 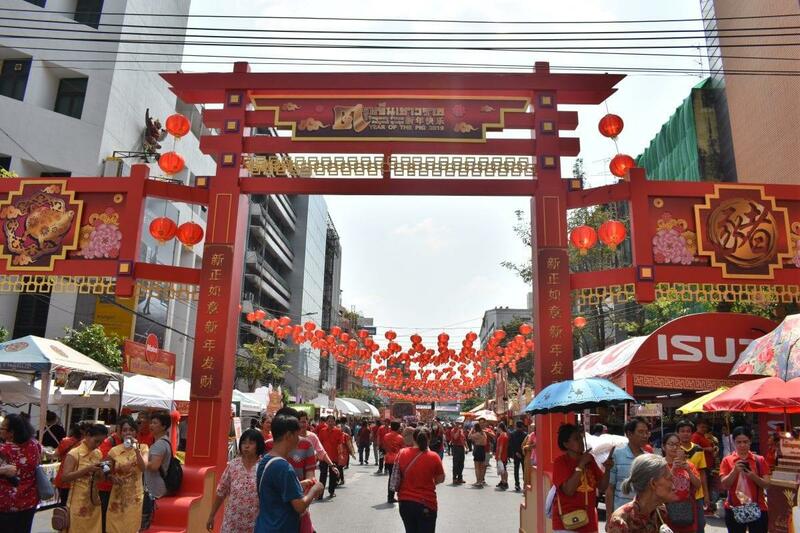 In the city, the celebrations are center around Yaowarat Road in Chinatown where the road becomes a walking street. Celebrations are also held at many temples and shrines in the area and around the city. On the first day known as Wan Chai or shopping day, people go out to shop for offerings. 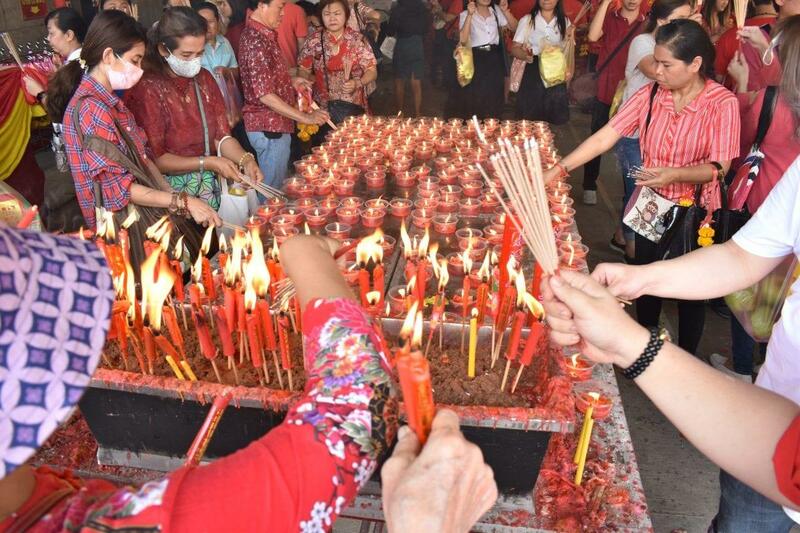 The second day is known as Wan Wai or worship day where people worship the gods and ancestral spirits. 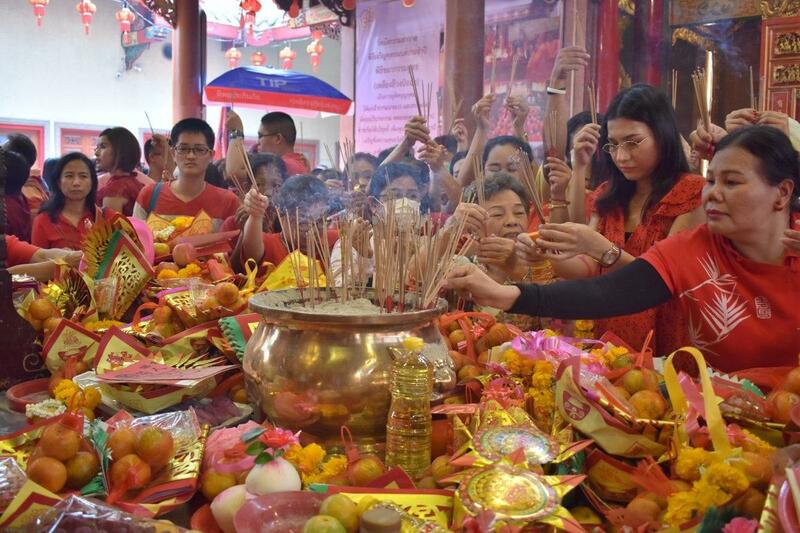 The third day is known as Wan Tieow or going out day where people visit and bless relatives. 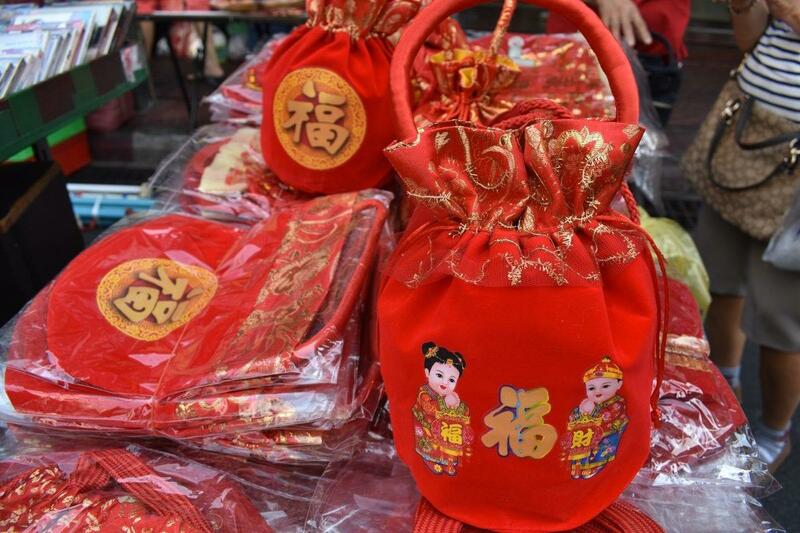 Chinese New Year is traditionally a time to honor deities and ancestors. 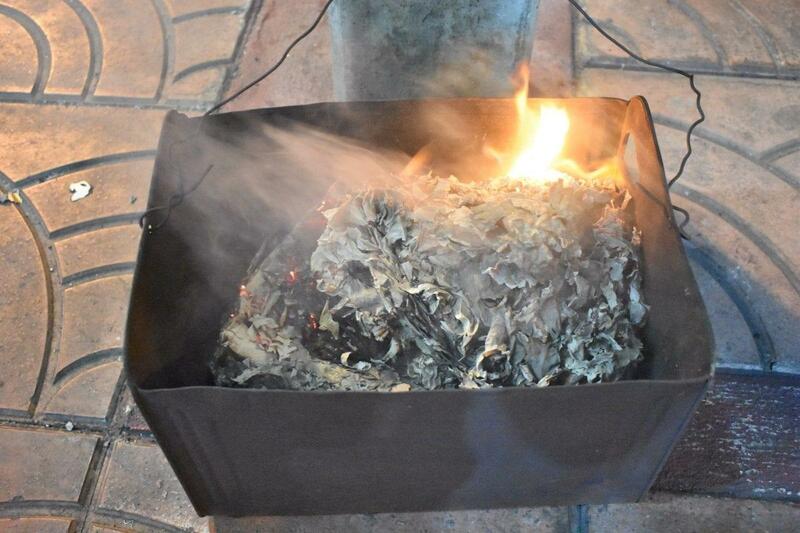 People burn paper items and put a candlelit table containing food and drink outside the home for the ancestor’s spirits. At temples and shrines, people offer prayers and make donations. 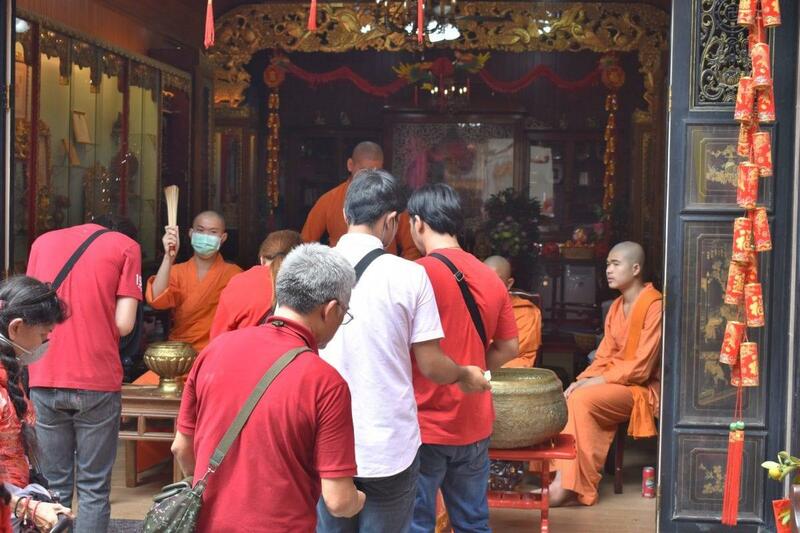 In return, they receive blessings from monks. 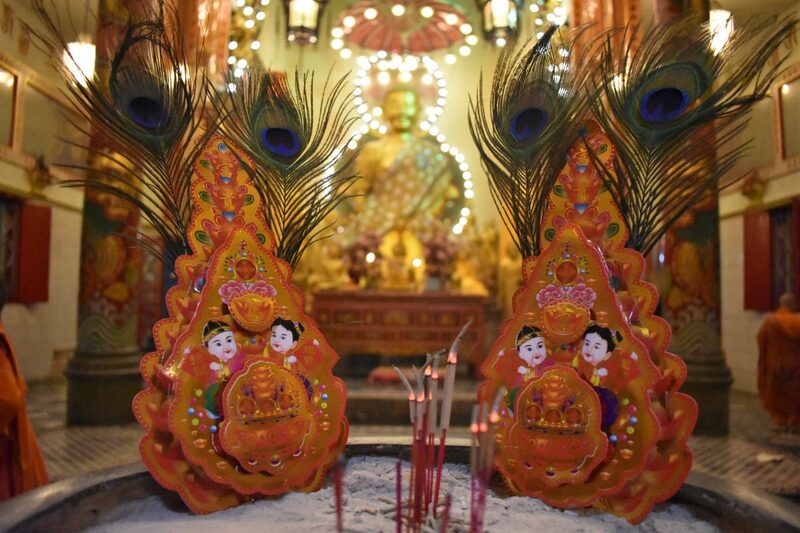 Buddhist images and statues of Chinese deities are worshipped. 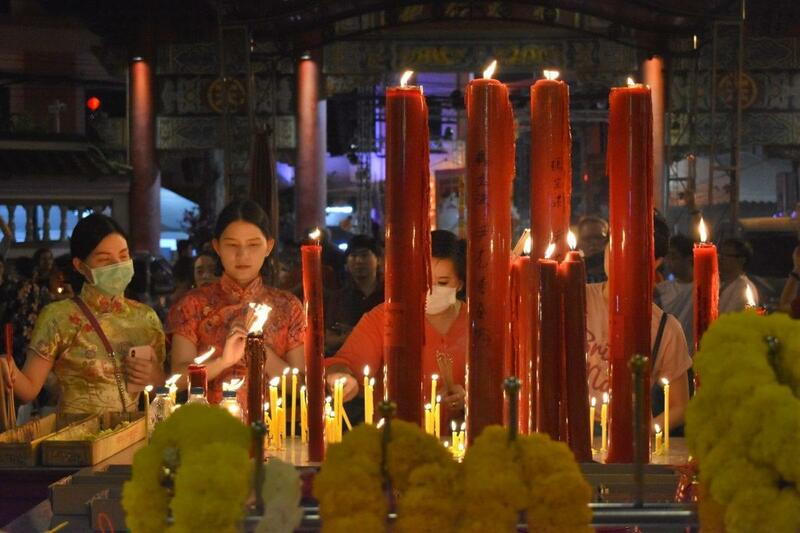 Worshippers wish for good fortune, happiness, wealth and good health. 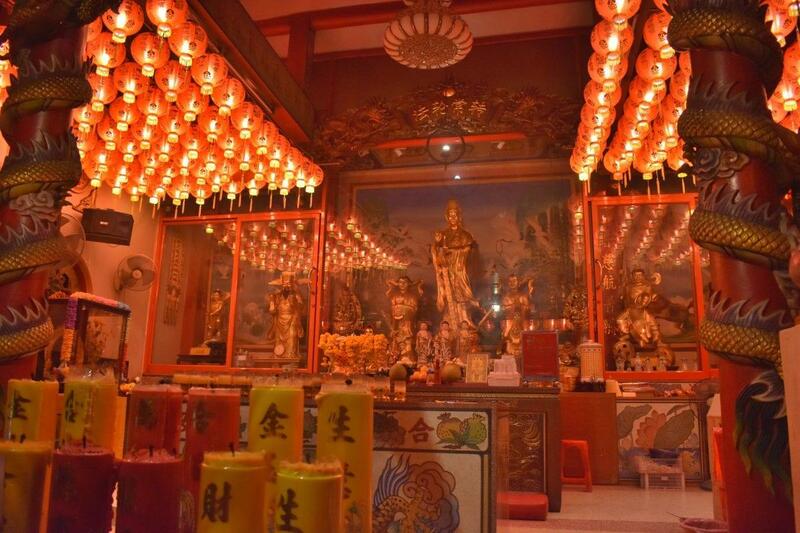 Mandarin oranges are popular offerings at temples as a sign of good luck. It is also a family occasion with families coming together for an annual pre-NYE dinner. Other traditional activities include cleaning the house to sweep away ill fortune and decorating windows and doors with red paper cuts. Red paper lanterns are hung outside houses and businesses. Another tradition is the giving of money in red paper envelopes. This is known as ang-pao. 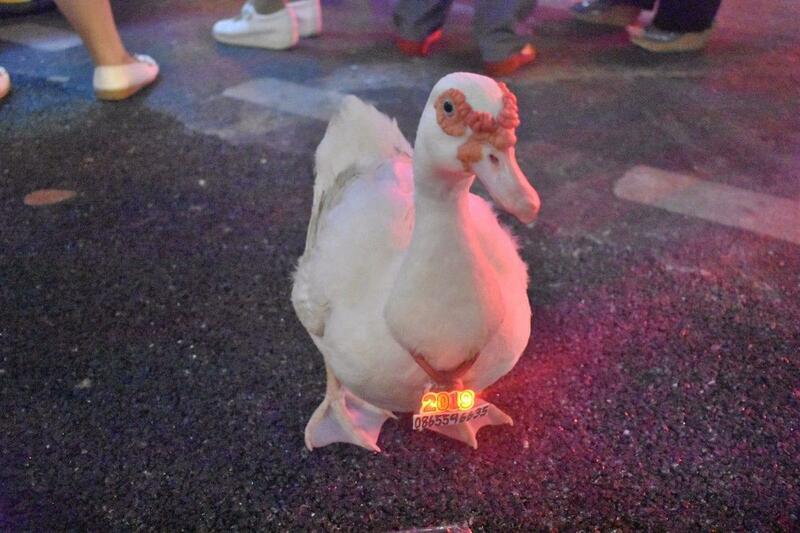 Most people wear red clothes to bring auspiciousness to the wearer’s life. Women traditionally wear beautifully decorated red dresses known as Qi Pao. We visited Yaowarat on new years eve and day. 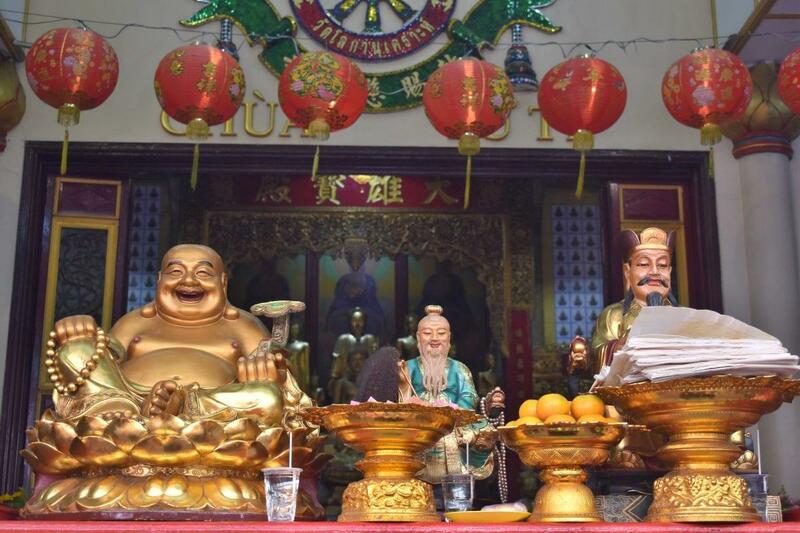 We started new years eve by visiting Wat Mangkon Kamalawat, the largest Chinese Buddhist temple in Chinatown. 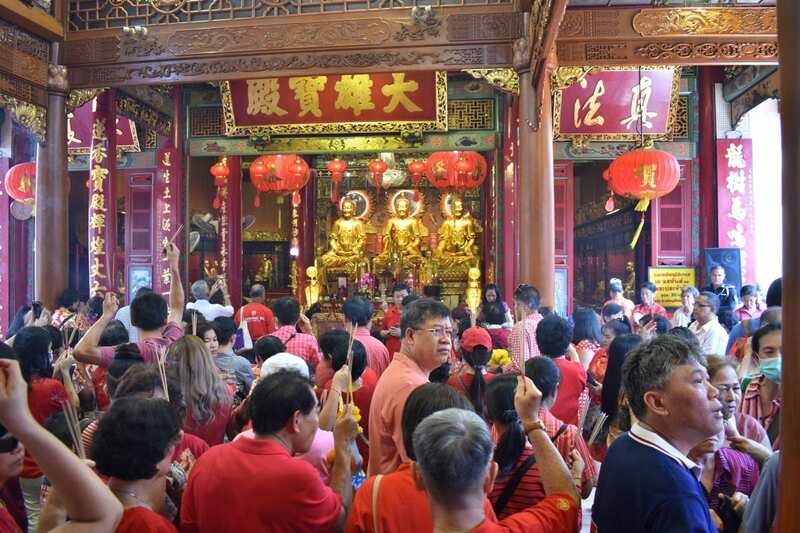 The temple, packed with local people paying respect to the various Buddha images and Chinese deities inside. 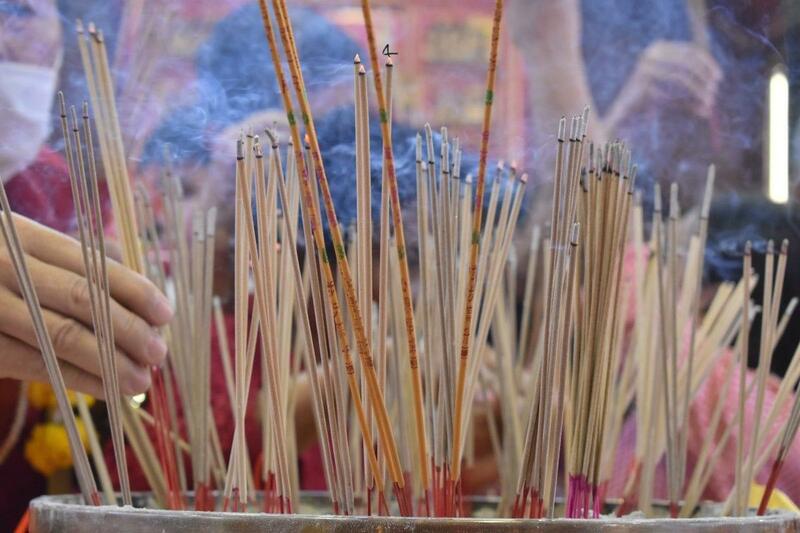 The air was thick with incense smoke. 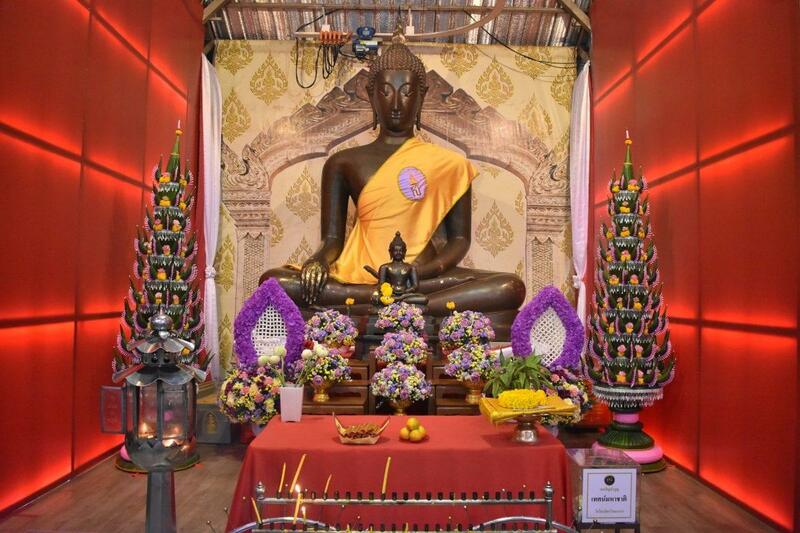 Worshippers were bringing offerings of mandarin oranges and yellow garlands which placed before Buddai “the laughing Buddha” just inside the main entrance and on a large altar in the Viharn in front of the three Buddha images. 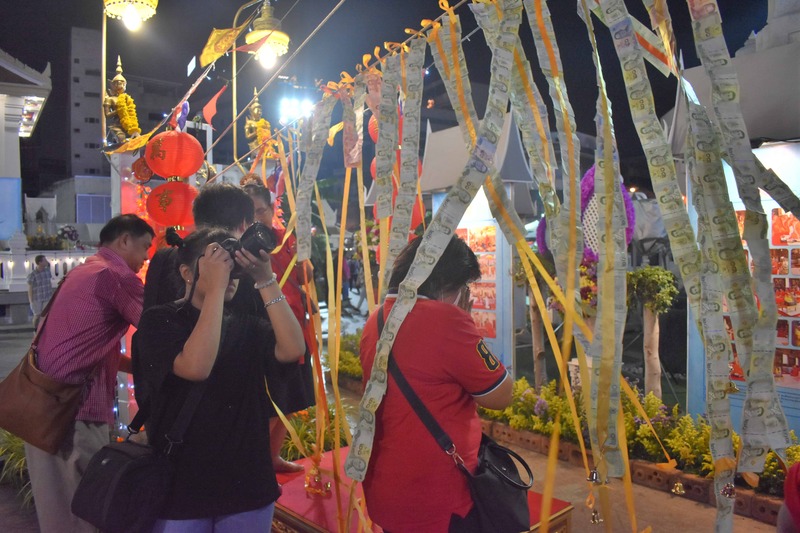 Around the temple, people were making merit by attaching notes to money trees, praying before the temples various deities and queuing to receive a good luck blessing from monks. The closed road from the Chinatown Gate to Grand China Hotel transformed the usually busy road into a walking street. Red lanterns were strung above parts of the street adding a splash of color to the road. Stalls on both sides of the road sold unique new year themed gifts and clothing as well as local food. Stages at both ends of the street featured cultural and musical performances. 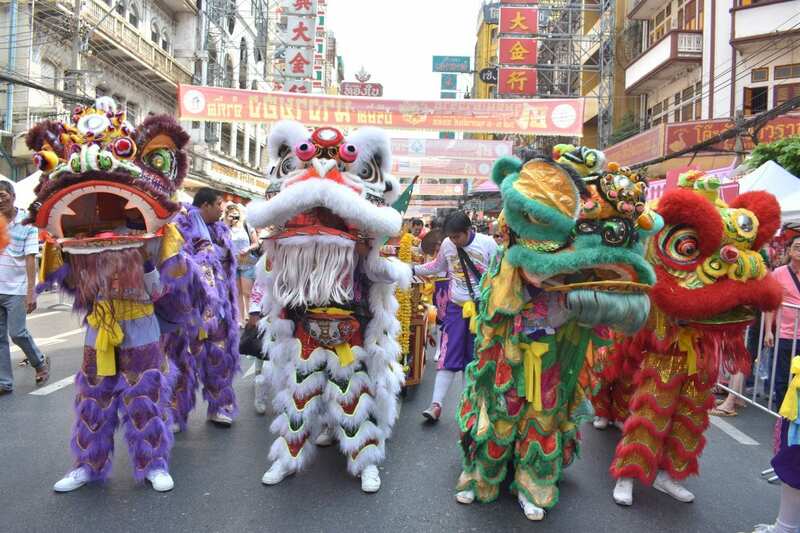 Lion dance troupes roamed Yaowarat Road and the side roads entertaining the crowds with their colorful performances and costumes. 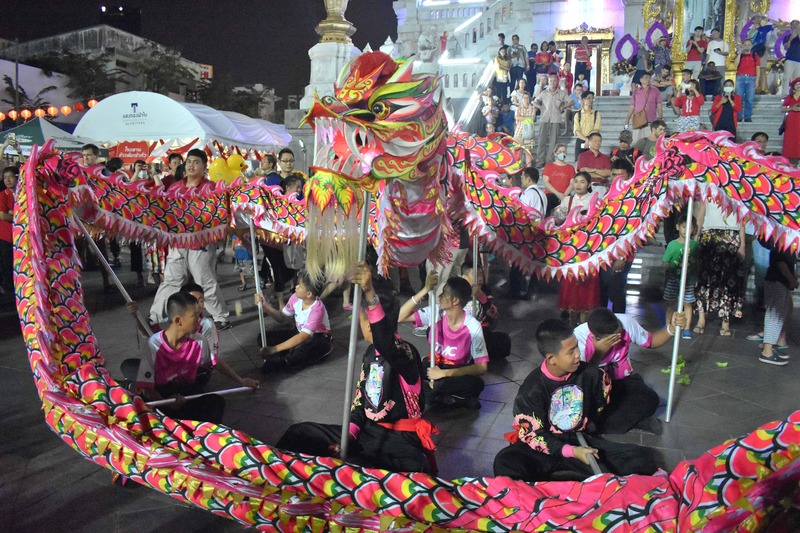 Chinese celebrations usually contain both Lion and Dragon dance troupes. Both the Lion and Dragon in Chinese traditional culture is seen as being mythical, powerful and auspicious. 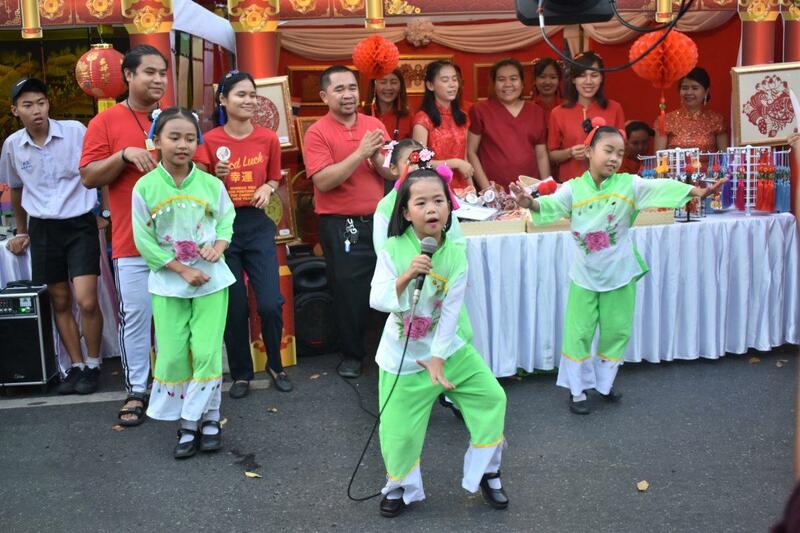 The purpose of the dance is to bring good fortune and prosperity to an individual, neighborhood or business. Each lion comprises a two-person team with one operating the head and front legs while the other controls the back legs. Musical accompaniment provided by drums and symbols. The lions are colorful and beautifully decorated with teeth and large blinking eyes. They act in a friendly way and will dance with each other before approaching people in the audience who are offering a monetary gift. 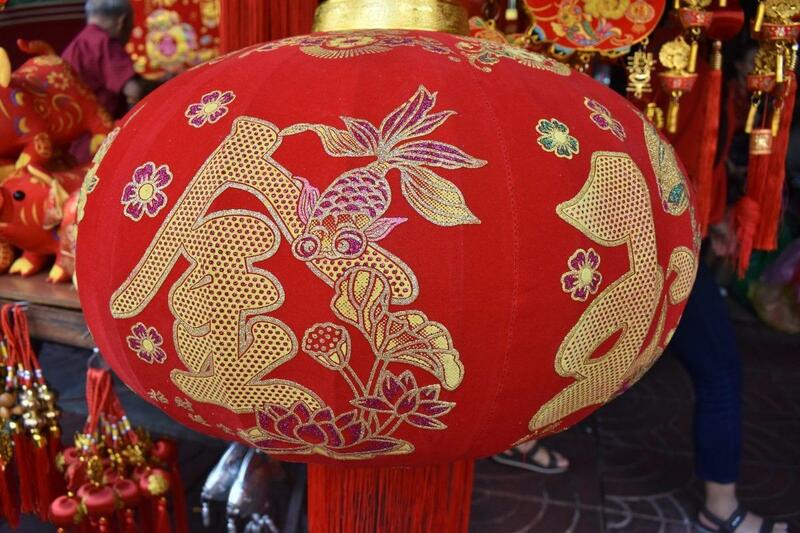 It’s placed in the lion’s mouth and should bring good luck to the giver. Sometimes the lion will respond to the gift by giving back mandarin oranges. 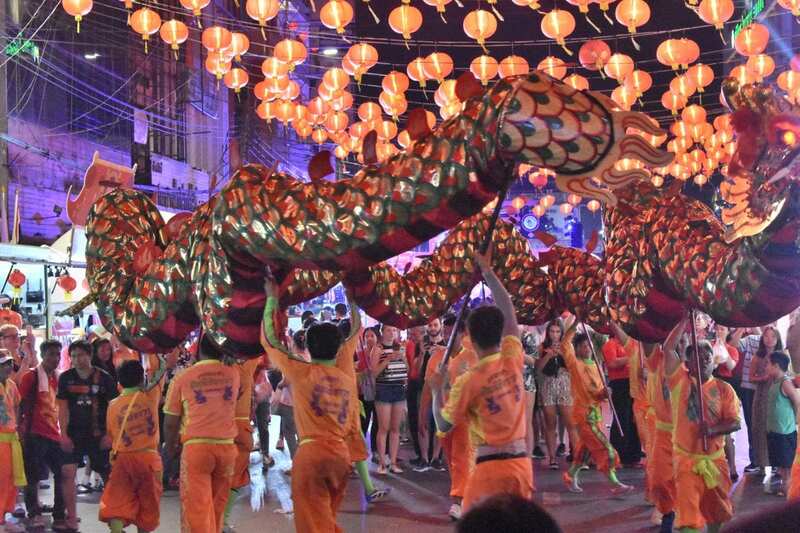 The Dragon Dance is more complex with up to 15 performers controlling a dragon. 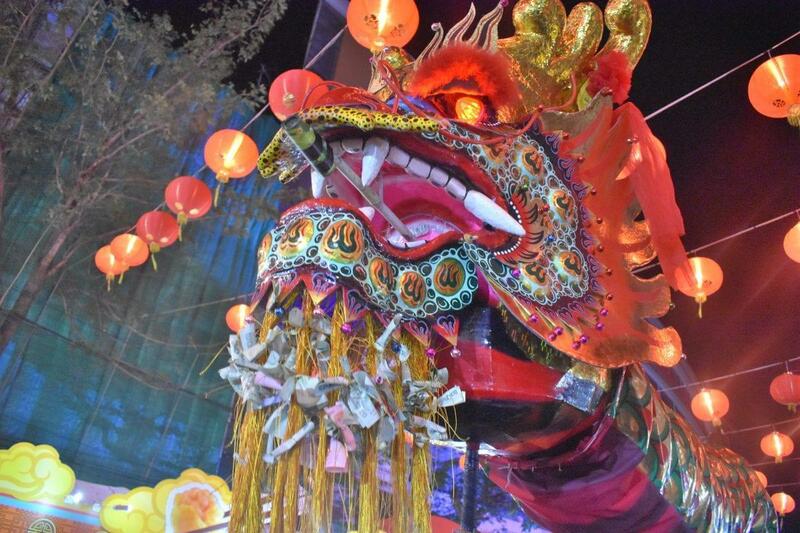 The dragon moves above the heads of the performers on poles with which they control the movements. The dragons are colorful and beautifully decorated with teeth and red lighted eyes. 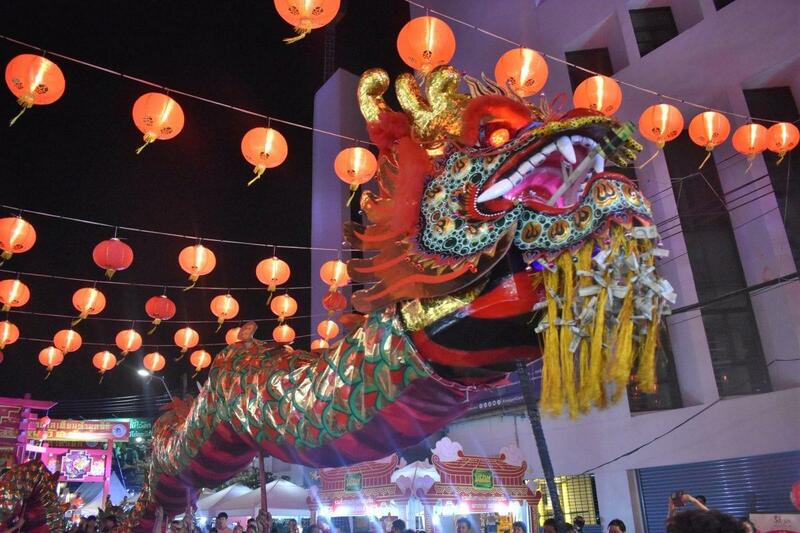 The length of the dragon is important as the longer the length the more good luck and prosperity it can bring. Dragons can also have fireworks attached inside the mouth and fired into the air. 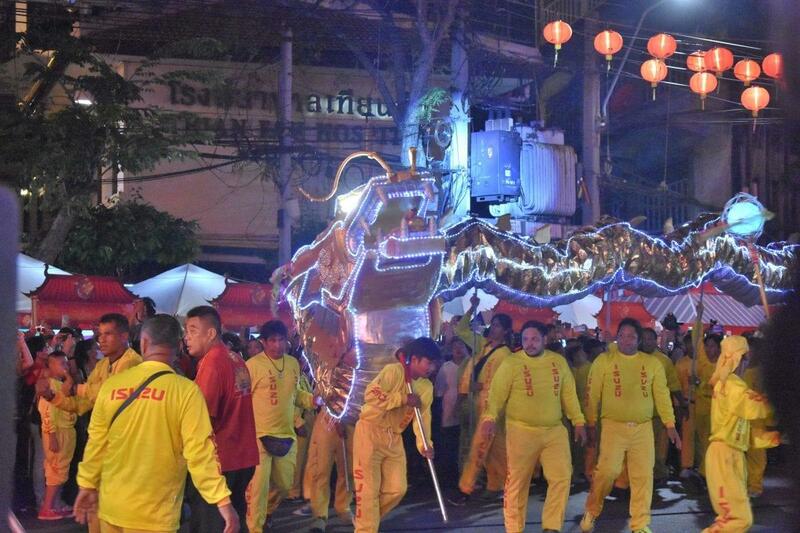 The dragon dance performances after dark were impressive, especially the massive golden dragon on New Year’s day. The performance was more of an acrobatic show with performers climbing & swinging from poles to control the dragon which snaked up a pole. 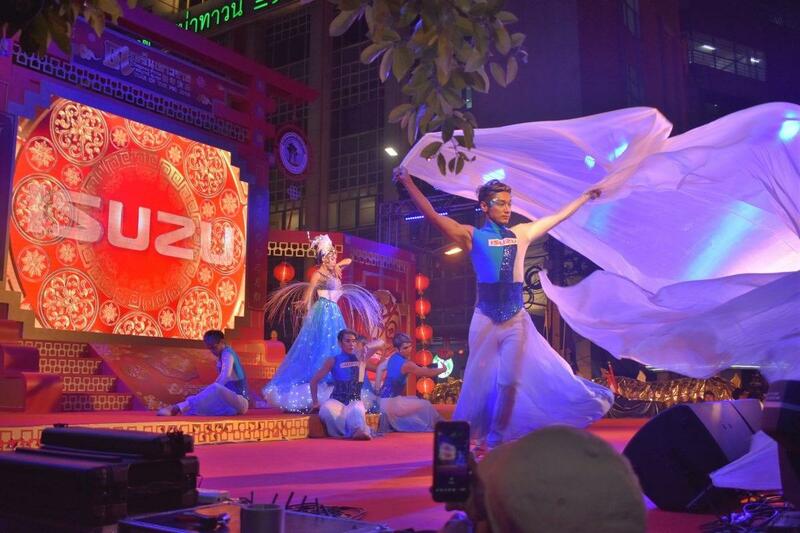 The main stage on Yaowarat Road featured cultural performances from Chinese artists who came from China to take part. 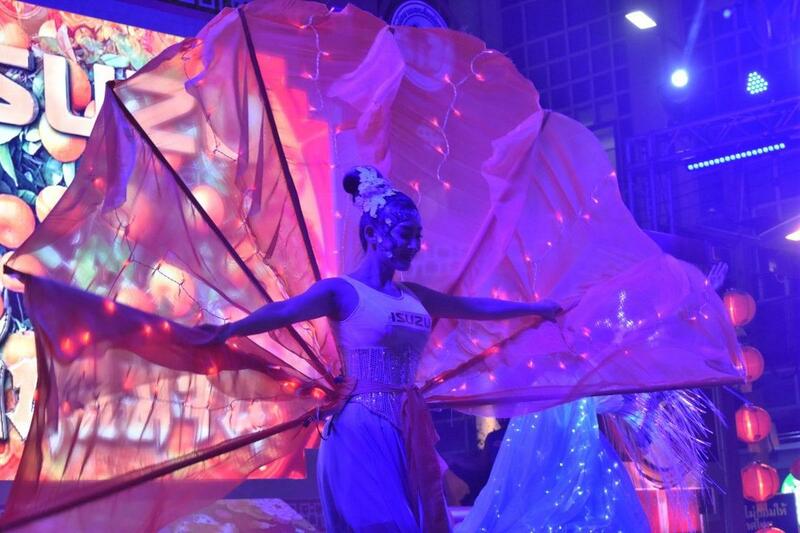 Most impressive were the dancers performing traditional dances with fantastic costumes and choreography. 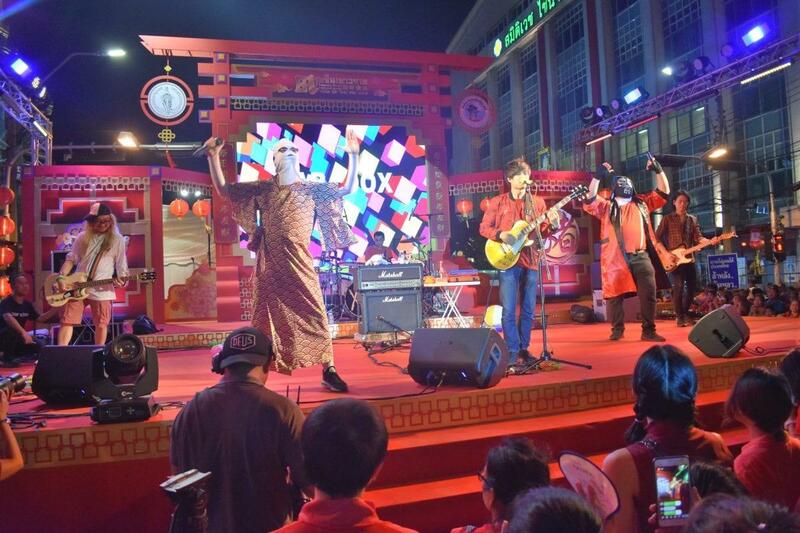 Local music artists featured the Japanese inspired girly pop of BNK48 and rock and pop from Paradox and Lula. The Shanghai Mansion hotel also had great music. 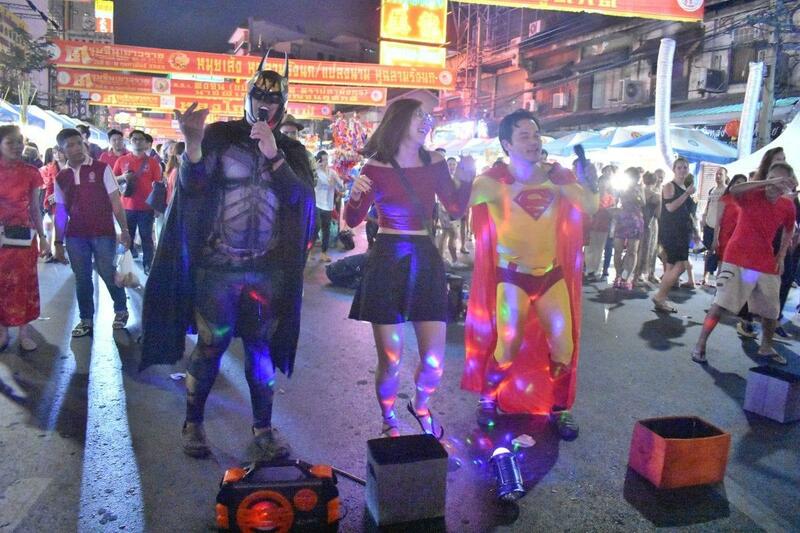 There were also street performers, magicians, and mime artists. The street food market was great with a massive choice of dishes from all over Thailand. Most of the Yaowarat regular street-side eateries were open expanding out on to the street. 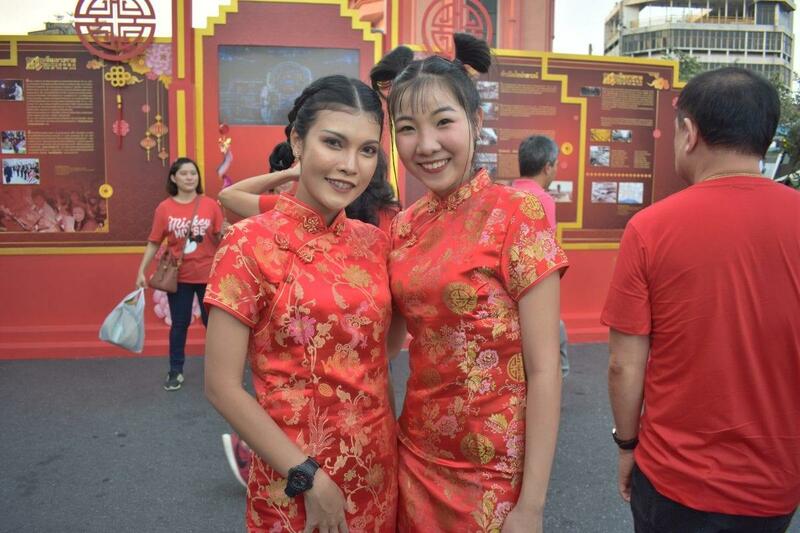 There were also special Chinese new year treats and cooking exhibitions. 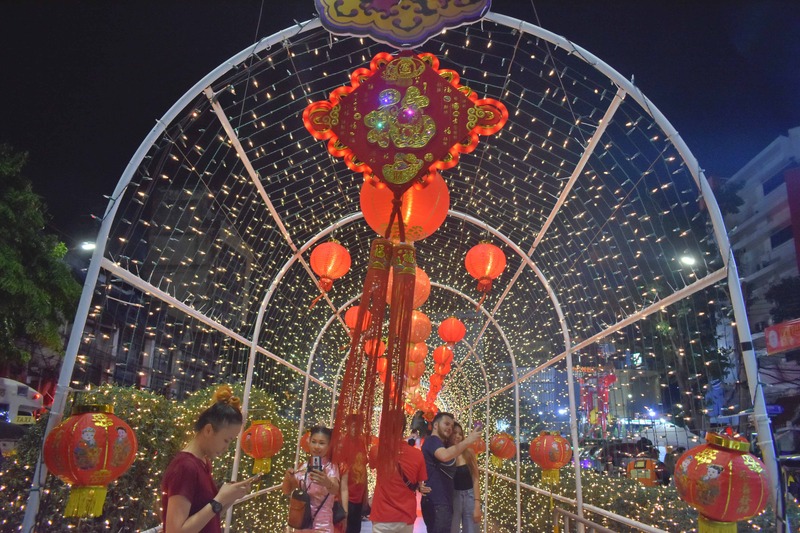 If you missed Chinese New Year 2019 you still have a chance to catch the colorful Lantern Festival in Yaowarat on February 19th. Subscribe to see regular updates.